When you think of the great soul divas there are three who come to mind; Aretha Franklin, Patti LaBelle and Shirley Brown (Sorry Whitney, not yet). Her 1974 recording of "Woman To Woman," is a song that has been covered many times, and was the last major hit for Stax Records before they went bankrupt a little over a year later. Her sporadic recording career took her to Arista in 1977 for one LP, back to the reformed Stax Records in 1979, and to the tiny Sound Town Records in 1984. Not much continuity for one of the greatest female soul singers ever. It wasn't until 1989 when she released her first album for Malaco Records that her career resuscitated, and now after five fine releases for that label, we have her finest achievement since that 1974 blockbuster. It seems that her personal life also had it low points too, as she dedicated her 1997 release to the memory of her late son Prentiss A. Brown, and on this new release she remembers that loss with the moving tribute, "Through The Storm," a Frederick Knight song that will bring a tear to your eye, and a song destined to become a classic. Hearing this song alone is worth the price of this release, everything else is a bonus. The first two tracks, "Sweet Lips, Big Hips" and "If You Keep Using My Love," are both dance tunes, with the former already getting it's share of airplay. It isn't until you get to the third song, "How Close We Came," a ballad that allows her voice to take full advantage of this extraordinary song, to produce another would be classic. Label mate Denise LaSalle's "The Best Woman" and the warhorse "When A Man Loves A Woman," which gets a "When A Woman Loves A Man" turnaround, are two other quality tracks. But above all, it is the glorious voice that soars above everything producing an album that will endure for years. 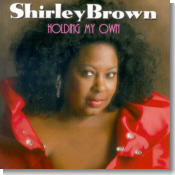 For those readers not familiar with Shirley Brown, this is a wonderful place to start. This CD will find it's way into many stockings this Christmas. I hope it's yours.